This August has been hot, humid and sticky in Toronto. To cool down, I've got you covered with an easy to make cold Lemon-Chaga Ice Tea from Four Sigmatic. This recipe is both hydrating and delicious, and you can totally enjoy it year round! This hydrating and refreshing Lemon-Chaga Ice Tea from Four Sigmatic is made with fresh lemon juice and Instant Chaga Mushroom Elixir Mix. Image courtesy of Four Sigmatic. The main ingredient in the Chaga Elixir from Four Sigmatic is pure wild-crafted chaga mushrooms. Chaga, the king of the forest, grows on birch trees found in the Northern Hemisphere, in places like Canada, Siberia, Nordic Countries, Russia and some Northern States in the United States. Chaga is one of the most researched mushrooms in the world and has been found to be a natural immunity booster that can improve your ability to fight infections, bacteria, colds, and viruses. Chaga contains a lot of antioxidants and is high in trace minerals, like zinc which helps protect your skin (your biggest organ), fights off bacteria and viruses, and lowers inflammation. Four Sigmatic uses both the darker outer layer and light brown inner layers of the chaga mushroom in their Elixer. To make sure you get the most out of this inedible, woody mushroom, Four Sigmatic uses a dual-extraction process. This means that all of the active water and fat-soluble components have been made bioavailable with boiling water and alcohol, respectively. After removing the alcohol and concentrating the extract, Four Sigmatic spray-dries it back to powder. It comes ready to use, in convenient one serving packets that you can take anywhere, so you can enjoy the medicinal benefits of mushrooms anywhere you go! Each serving includes 1,500 mg of the most potent chaga extract with at least 30 percent polysaccharides (more than 1 percent of which are beta-glucans) and 2 percent triterpenes. No starch, sugars, or any fillers … at all. Rose Hips have been included to increase absorption. Each packet has 15 mg of natural Vitamin C from the rose hip extract (25 percent RDI), which makes it easier for your body to take in the benefits of the mushrooms. Zero sweeteners - but, you can add your own! 1. Dissolve packet in 50ml of hot water. Mix well and add 150ml of cold water. 2. Squeeze the juice of 1/2 of lemon in and mix well. 3. Add ice cubes to glass/mason jar and pour Chaga-lemon mix into the glass. This refreshing Lemon-Chaga Ice Tea from Four Sigmatic is made with fresh lemon juice and Instant Chaga Mushroom Elixir Mix. Image courtesy of Four Sigmatic. 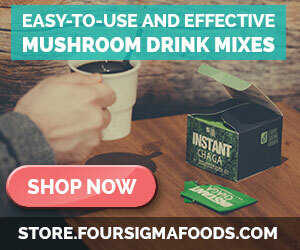 I recently interviewed Four Sigmatic President Tero Isokauppila, who shared all about his travels in search of superfoods, some common misconceptions about medicinal mushrooms and of course, his favourite way to drink mushrooms. You'll find the full interview here! Special thanks to Four Sigmatic for sharing this recipe! Don't forget to check out Four Sigmatic on Facebook, Instagram, Twitter, Pinterest and on their website. Click here to check out Four Sigmatic's full line of products and I've got a special promo code for Love Wild Live Free Readers - enter code LOVE for 10% off! This post was in collaboration with Four Sigmatic and the product used were kindly gifted for review. I only share products that I personally use and that are made with the highest integrity. The links and coupon code provided are affiliate links, which means that if you visit Four Sigmatic's website through one of these links and purchase product, I’ll get a commission. Don’t worry – the price is still the same for you, plus you'll get a 10% discount with my promo code!